Read here about Karl Ioganson, aka Karlis Johansons, a Russian sculptor who created sculptures that we would today call "tensegrity" in the 1920's. The constructivist Latvian artist Karlis Ioganson (1892-1929) has recently been identified as a significant innovator in the intellectual history of tensegrity. Thanks to research published since the 1990's, we can now assert with confidence that Ioganson built the first tensegrity prism and other tensegrity constructions. While his models were never seen by those who re-discovered tensegrity in 1948, clear lines of influence can be traced from Ioganson's death to Black Mountain College. Karl Ioganson was born Kārlis Johansons in Cesis, Latvia. Owing to transliterations from his native language his name is usually spelled "Karl Ioganson" in tensegrity literature, so we retain that convention here. His biography has also been confused with the artist Boris Joganson. Ioganson's most significant exhibit was in the Soviet Association Of Young Artists (Obmochu, Obmohu or Obmokhu). Other organizations include the Soviet Institute for Artistic Culture (INKhUK) and the Museum of Painterly Culture, or MZhK. The relative dearth of information regarding Ioganson and his achievements was the result of the ethnic purges in Soviet Russia in the thirties, when Latvians were considered to be potential enemies of the state, and many were executed. Ioganson's art movement as well was deprecated, since the Soviet system privileged social realism over abstraction. Abstract art that could not depict an object was loosely categorised as “formalism” and was actively sought out and destroyed. The parallels to Nazi Germany and its category of degenerate art, “entartete Kunst,” are unmistakeable. 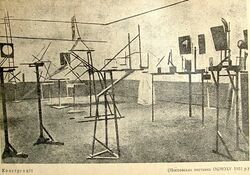 Ioganson’ most important work, the constructions exhibited in the 1921 Obmochu exhibition in Moscow, has disappeared, and only a handful of photographs allowed Ioganson’ accomplishments to be independently assessed by contemporary scholars. Karl Ioganson was born in 1892 in Cesis, Latvia. Ioganson's father, a construction foreman, had a low evaluation of artists. In his disparaging view, artists were all freeloaders. In spite of his father's opposition, Ioganson entered the Riga Art School and started a classic beaux-arts education as a sculptor. His studies included a thorough grounding in drawing and the rules of perspective. This school closed in 1916 because of World War I, so he and other students from the school moved to Penza to continue their art studies there. The course of the war led Ioganson along with many Latvian students to enlist in the Latvian Riflemen battalions. In the ensuing Russian Civil War Ioganson’ Latvian Riflemen regiment sided with the Bolsheviks. When the Bolsheviks established themselves as the new leaders of Russia, this regiment was stationed in the Kremlin to guard the new government. The Latvian Riflemen were able to participate in many cultural activities. They even established an art studio for their own use in the Kremlin. Ioganson and other Latvian artists in the Riflemen were able to continue their work with art. They had contacts with the Russian art circles of the time and some Latvian artists, including Ioganson, participated in the post revolutionary Moscow art world. Ioganson joined a group that called themselves Constructionists. They had lengthy discussions about the role of art and the artist after the revolution, and concluded, that artists should become designer engineers as part of the manufacturing process in factories. The previously accepted artistic values of beauty, composition, colour and form were now held to be virtually meaningless. The new maxims were functionalism and efficiency. The artist should research these aspects of manufactured goods. With these things in mind, Ioganson produced a series of conceptual works, to display the structure of things. He felt, that the most important aspect of anything was the way in which this thing was put together, its connections, and for Ioganson all connections were varieties of a spatial cross. Nine of Ioganson’works were displayed at the famous 1921 Obmochu (The Union Of Young Artists) exhibit in Moscow. Ioganson grew up in the Latvian part of the Baltic province of czarist Russia in a Latvian family, and was exposed to Latvian ornamental tradition, including weaving patterns (the women of his family were weavers), and the typical house decoration at Christmas and Easter, called “puzurs.” Latvian weaving patterns are characteristically Northern European patterns, often emphasizing crosses of various designs, which repeat themselves in different sizes, almost like fractals, geometric figures created by the repeated application of simple mathematical rules. 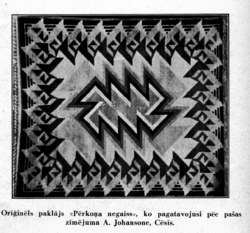 See for example the Latvian carpet “Thunderstorm”, as it appeared in 1931. The “puzurs”, a traditional decoration still used by some Latvians today, is made by threading together cut pieces of reeds or straw and forming three dimensional geometric constructions, that are then hung from the ceiling as decoration. Combining smaller elements makes larger “puzurs”; the basic root element is an octahedron, a crystal. Ioganson was most probably exposed to crystals in school. The Froebel system of Kindergarten (created by Friedrich Froebel 1782-1852) was then popular in Latvia. It is based on the idea that the world consists of crystalline structures, whose qualities should be perceived by children at an early age through direct work with materials. A long list of leading modernist artists and designers have been to Froebel Kindergartens as children, including Buckminster Fuller, Frank Lloyd Wright, Corbusier, Gropius, Kandinsky, Klee, and Mondrian. Adolph Oderbecke, Der Zimmermann , Leipzig 1913, Verlag von Bernh. Friedr. Voigt. World War I affected Ioganson profoundly. Ioganson was no doubt impressed by the rapid development of new war technology, airplanes and radio, and became personally convinced, that, just as quickly, the Bolsheviks would develop a new society, communism, which would use the power of technology for the good of all. He also saw the rise of pure tension, or wire, in functional structure. He had seen the World War I trenches in Latvia with their barbed wire, as well as radio antennas composed mostly of wound wire. Ioganson promoted two critical concepts in the context of Constructivism. Ioganson became convinced that the artist of the beaux-arts era was a complete anachronism. The artist in this new technological and communal society would be a constructor, an engineer, who used his special talents to facilitate the manufacture of goods for the masses. All of his experience – his upbringing, his schooling, his war experiences, his being exposed to many different connections with materials – helped lead him to the construction of a true spatial cross. 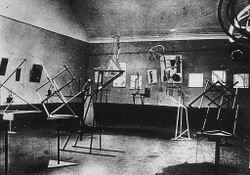 In 1921 together with four other artists, Alexander Rodchenko, the brothers Georgii and Vladimir Stenberg and Konstantin Medunetskii, Karlis Ioganson exhibited a total of 25 spatial constructions as part of the Obmochu (The Union of Young Artists) exhibit in Moscow. All but two of these constructions (one of Rodchenko’s at MoMA and one of Medunetskii’s at Yale) have disappeared, including all of Ioganson’ nine constructions. Ioganson was not a big talker, nor a prolific author, but a few words and letters remain. "Space" in "spatial" is meant in the deepest meaning of the term--empty space itself becomes a significant element in the construction of the artifact. Along with "spatial construction" Ioganson used the word "cold." He maintained that every spatial "cold" connection is a cross, cross meaning lack of hot welding or molecular bonding. For someone involved in construction, using Latvian or Russian terminology, the concept of a cold connection is clear. There is no melting of materials, no flowing together of plastic materials. In place of hot rivets, there are bolts and nuts, simple, cold fasteners. Of course elements, that are to be connected, must cross each other somewhere, somehow. And in order to make fast one element to another, the crossing needs to be stabilised. Ioganson explored various cross- stabilising methods for differently formed elements and showed paradigm examples in his constructions. The stabilisation was possible by using a geometrically stable connection of planar surfaces, by adding tensile structural elements (Ioganson used steel wire), by filling in areas with sheet materials, or by a combination of these methods. It is very probable, that Ioganson was thinking of building construction in particular, when he constructed his exhibit structures. Post revolutionary, post civil war Russia was in dire need of buildings, but unfortunately the supply of experienced engineers and construction workers had been decimated. It is difficult to weld and hot rivet, much easier to screw things together with fasteners. Perhaps Ioganson was looking for construction methods, which permitted the use of inexperienced workers. Ioganson’ nine structures form a progression that shows his ideas developing. Especially in the first works (excepting one purely symmetric construction) elements clearly go by each other in different spatial directions, simultaneously creating symmetry and asymmetry, depending on the observer’s point of view. Exactly the same approach is visible in Dutch de Stijl. The important constructive connection created by three square rods, placed on xyz axes is precisely responsible for the charm of Gerrit Rietveld’s red, blue yellow chair, and is the beginning of Ioganson’ investigations as well. Whereas De Stijl with Rietveld and Mondrian concentrate on unbraced right angled connections, Ioganson went further using tension wires as braces, exploring the connection with different angles and different shaped rods. The circular rods, touching each other only at points not surfaces, were definitely more difficult to “wire up”, and led to three rods connected by wires, but not touching at all. We can almost feel Ioganson fumbling with the circular rods and tensioning wires, as the central xyz joint refuses to coalesce, and then noticing, that they still held together, but remained apart from each other, not touching, the world’s first classic tensegrity. Although the main thrust of Ioganson’ work was to stabilise the spatial cross, to make it static, and to do this by balancing both compressive and tensile forces, his theoretically most advanced structure was dynamic in the sense that it was easily moveable, and a photograph of this structure has appeared in many publications, especially in the 1929 Bauhaus book by Moholy-Nagy “von material zu architektur”. And there is other evidence, that the conceptual discoveries made by Ioganson were understood and developed further at the Bauhaus in the 1920s and the early 1930s. Paul Klee's drawings of wooden struts connected by rubber bands, although only 2 dimensional, fully illustrate the principle of continuous tension, a principle that Ioganson never explicitly stated. For Klee the balancing of outwards oriented, expansive force, and inwards oriented, limiting force creates form. Moholy-Nagy and Josef Albers, another well known Bauhaus teacher, used Ioganson’ work in a teaching unit on balanced structures, and students’ work often exhibited tensegrity type connections with tensioned wires stabilizing structures. These concepts became part of the Bauhaus instruction program. A particularly good example of the results of this instruction is a 1945 chess magazine cover by Xanti Schawinsky, who had studied at the Bauhaus. 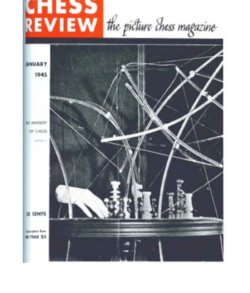 On this cover, Schawinsky uses a structure made of rods and connecting filaments to depict the process of thought. In fact, similar work was done earlier in Moscow in the Russian design school VHUTEMAS. In the 1920’s, as Khan-Magomedov noted (in S.O. Khan-Magomedov, Constructivism, Moscow, publisher Stroiizdat, 2003, pg. 147), Ioganson’ spatial cross became a stylistic element of Russian constructivism in design, theater decoration, architecture and the design of small objects. Black Mountain College was created in 1933 as a reaction to the mainstream conservatism of undergraduate institutions in the United States. Its curriculum was inspired by the Bauhaus program and its faculty constituted of Bauhaus refugees. Walter Gropius and Marcel Breuer design for its campus was never built, but the college did implement radical, experimental curricula where co-dependence and a democratic spirit governed all aspects of life. The arts were Black Mountain College’s defining legacy, and these form a continuous link back to Ioganson's Constructivist milieu, via the Bauhaus. The College maintained ties with several refugee Bauhaus masters. It hired Josef Albers as a professor of the arts immediately after the Dessau Bauhaus closed and later hired Anni Albers, who taught a weaving workshop, and Xanti Schawinsky, who taught drawing, painting, and typography. Together, the three indoctrinated Black Mountain College’s arts curriculum with the Bauhaus’ general course. Schawinsky even gave open lectures on Bauhaus architecture and design when the College began to consider architects for the Lake Eden campus. These people brought the ideas of spatial structure, cold structure and the cross with them. When Fuller and Snelson arrived to study in 1948, this was the fertile ground in which they rediscovered tensegrity in their semantic terms and language, distant from Constructivism and closer to Euclid and Fourth Dimensional geometry. Why has it taken this long to acknowledge Ioganson’ contribution as the first discoverer of a true tensegrity structure? There are many reasons. He died young. He had no relatives that asserted his claim. He was Latvian, and there are not many Latvians. Of those in Russia that knew of him and his work many, including two close associates, Drevins and Klucis, were murdered in the purges of 1937. The doctrine of social realism helped wipe out all abstract art. But more recently no state has been murdering Latvians for ethnic reasons, and social realism is long gone. Yet reproductions of Ioganson’ structures were exhibited in Latvia for the first time in 2014. Ioganson’ work reproduced by Vjacheslav Koljeichuk, using mathematical photometric techniques, has been previously exhibited in Russia, Germany, Great Britain, the Netherlands, the United States and now in 2014 is being displayed for the first time in Latvia. An exhibit in Brussels 2015 will be the first exhibit of his work in Belgium. Ioganson, invisible for so long, is just now becoming visible. Any controversy about these early discovery claims stems from misinterpretation of poor quality photographs and mis-translations of documents originating in Russian. We rely here on the careful detective work of Sils and Gough, along with the supporting evidence of Klee, Schawinsky and other Ioganson works. Before Sils and Gough completed their work, others came to different conclusions. We list those conclusions here. French engineer David Georges Emmerich has also noted how Ioganson's work seemed to foresee tensegrity concepts. Emmerich wrote in his "Structures Tendues et Autotendantes" in 1988, "Cette curieuse structure, assemblée de trois barres et de sept tirants, était manipulable à l'aide d'un huitième tirant detendu, l'ensemble étant déformable. Cette configuration labile est très proche de la protoforme autotendante à trois barres et neuf tirants de notre invention." Gómez Jáuregui interprets this as follows: "this means it was a structure consisting of three bars, seven cords and an eighth cable without tension serving to change the configuration of the system, but maintaining its equilibrium. He adds that this configuration was very similar to the proto-system invented by Emmerich, the "Elementary Equilibrium", with three struts and nine cables. All the same, the absence of prestress, which is one of the characteristics of tensegrity systems, does not allow Ioganson's “sculpturestructure” to be considered the first of this kind of structures." Kenneth Snelson denied the claim of Ioganson's prior discovery. He insisted that Ioganson's work was much further than one step from his own concept of tensegrity, but he has acknowledged the constructivists as an influence for his work. Snelson wrote: "I wouldn't have been able to make out from that famous jumbled 1921 exhibition photo that Ioganson's piece (marked number IX) was indeed a three-strut tensegrity structure. I then considered, since even I wouldn't have been able to verify it as such, that Koleichuk would have no way of guessing at the object, sticks positioned and strings properly attached, except that he had studied my work, or Bucky Fuller's or David Emmerich's. No one on Earth would have been able to discern the nature of IX without prior acquaintance with the tensegrity primary. The hint that he had studied me was your quote from Koleichuk which is an appropriated paraphrase, "It is as if they are floating in a net of... Wires" Coming across one's own words mouthed by a stranger is eerie indeed. My standard descriptive name, "floating compression" goes back to, at least, 1962. So, is number IX indeed what Koleichuk says it is? Once you see his model it looks like the piece there in the background. If indeed it is, is it not uncanny that Ioganson nor anyone else left a comment about this surprising object; that he himself placed no emphasis on it; that he apparently quite abandoned his amazing discovery with no follow-up? Did none of the other artists or visitors think it represented a remarkable phenomenon? Wouldn't one expect him to take a next step, any next step that would let us know he had a grasp of what was going on with the structure? Apparently not. As far as we can tell, the startling discovery just sat there among his other works and those of his colleagues, absent of discussion. It seems clear from Snelson's comments and all of the above evidence that Snelson had no direct influence from Ioganson's Obmoshu models. It does seem clear, however, that echoes of Ioganson's work helped create the fertile atmosphere within which Snelson independently discovered tensegrity structure, which he then elaborated to a very high degree. The Black Mountain College general intellectual atmosphere had many streams of thought to which Ioganson contributed, such as space as a compositional element, the use of tension wire, and Fuller's polyhedral and geodesic studies which themselves benefited from the general fertile soil of fourth dimensional and Constructivist thinking. Anders Sunde Wrolden's dissertation contains an image of Ioganson's 1921 model. The image is not very clear. Interpreting this image, Marcelo Pars wrote, "The picture on page 14 of his dissertation shows something with three struts, but I don't think we call that a tensegrity because the struts touch each other." 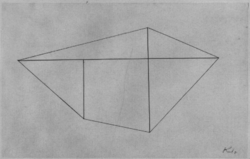 Burkhardt wrote: Ioganson's structure does look like a tensegrity prism to me. In the photo enough of the struts are visible to see the characteristic twist angle--the 30 degree twist angle of the triangular ends relative to each other. Obviously it isn't at the stage of tensegrity development of Snelson Early X-Piece, just as Snelson's wasn't at the stage of development of Fuller's t-icosa , but to me they are all innovative tensegrity structures demonstrating important new steps forward in the technology, with Ioganson's being the first step, even if he didn't make a tensegrity prism. The interesting thing is Ioganson made the piece with only nine tendons, unlike Ted Pope's 1957 piece which was made with 12 tendons. The tendons on Pope's piece formed a complete octahedron, and it could be constructed so the struts don't touch by making the tendons slightly different lengths instead of all the same length. This page was last edited on 24 November 2018, at 17:51.